“Nothing like being at home”, is a phrase that is often heard among Venezuelans who decide to apply to the Plan Vuelta a la Patria from the Republic of Ecuador. No electrical sabotage, economic blockade or media campaign can diminish the love that Venezuelans feel towards their Homeland. To understand that no country in the world cares about the welfare and progress of its compatriots like Venezuela. Expressed even by foreigners and endorsed by the 13,810 returnees who have participated in this initiative launched by the president, Nicolás Maduro Moros. During the last eight months, this social program has served as an air and land bridge for the voluntary return of all those migrants and their families who lack of the economic means to incorporate their daily life back in Venezuela. Ecuador: country of expectations and few opportunities. This weekend two flights of the airline Conviasa were arranged for the repatriation of 160 nationals from the Republic of Ecuador. The city of Quito and Guayaquil were the scheduled destinations on this occasion. 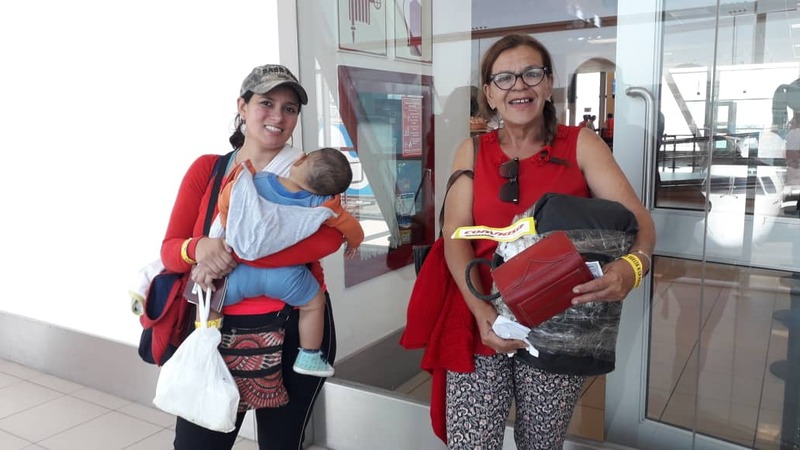 Carlos Moreno from Valencia, decided to return to Venezuela because he fears being away from his loved ones in case of any eventuality, while expressing feeling dissatisfied during his stay in Ecuador. “I emigrated to a country thinking that it would be fine, but it was very bad for me (…) my expectation is to find stability in Venezuela and be considered in the benefits granted by the Carnet de la Patria. For her part, Skeider Zambrano, a young mother, confesses that in the time she was away, she learned to value her country, she also hopes to provide a better future for her son, exercising her profession, because she could not succeed in Ecuador. “I am a teacher of early education (…) now that I return I hope to get ahead and move forward with my country, to build Homeland,” she concluded. In recent days the Bolivarian Government has denounced the refusal of the governments of Colombia and Argentina, which did not grant the necessary overflight permits. It should be noted that this measure is only applied against Conviasa flights destined to the Plan Vuelta a la Patria, but does not apply to commercial flights of this State airline. Which constitutes a clear violation to the human rights of the people who are preparing to return to Venezuela – among them; children, seniors and patients. It is no secret that this is a conspiracy between countries that succumb to the designs of the US government, which is currently openly promoting a war against the Venezuelan people. In keeping with the social protection system established in the Consitución of the Bolivarian Republic of Venezuela, the national and his/her family will have free transfer, opportunities for labor, educational, social and cultural reintegration. They will also be able to access all the social protection benefits granted by the Bolivarian Government through the Carnet de la Patria. No, it is being applied in an experimental phase due to the number of requests that arrive daily to the Diplomatic Missions. Currently, the countries with the highest number of applications are Peru and Ecuador.